Something has gone terribly awry in Canada’s Ocean Playground. 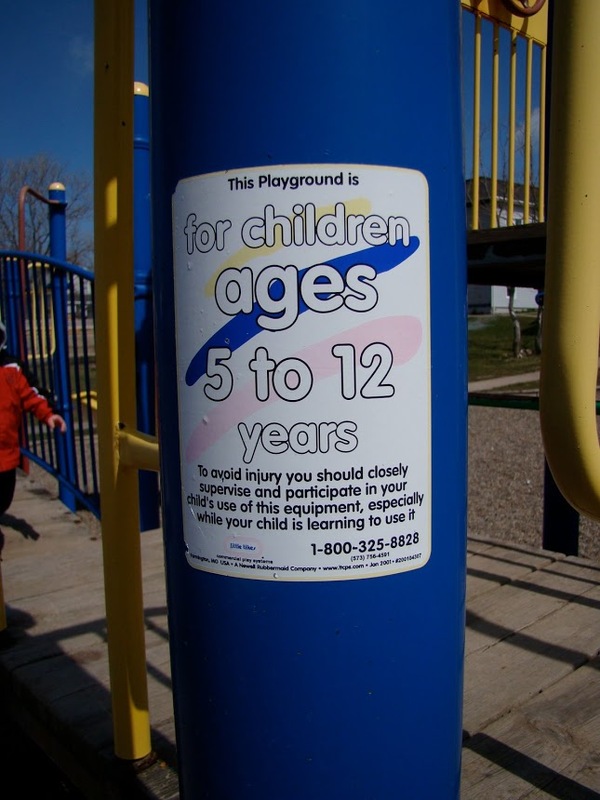 This September, many of the kids entering school for the first time in Nova Scotia will apparently be persona non grata on school playgrounds. This sorry state of affairs is an unintended result of s recent policy shift. A combined safety standards and insurance SNAFU was discovered last fall. That’s the first time that kids having their fourth birthday on or before December 31 were able to start school as part a new provincial pre-primary program. The pre-primary cohort is weighted to three and four-year-olds. That’s the nub of the problem. Off the shelf playground equipment installed in numerous schoolyards is labeled and recommended for use by kids in the five to twelve-year-old age range. The School Insurance Program (SIP) has not recommended the use of this equipment for kids under the age of five. The institutional response from the provincial department responsible for education and from individual school districts upholds the SIP recommendation while emphasizing that SIP covers all primary school students regardless of age. And so it goes…. none of the kids starting out in the pre-primary program will be able to play on school sanctioned playground equipment until they are in primary unless the equipment is deemed to be age appropriate. …this just happened at our elementary school. 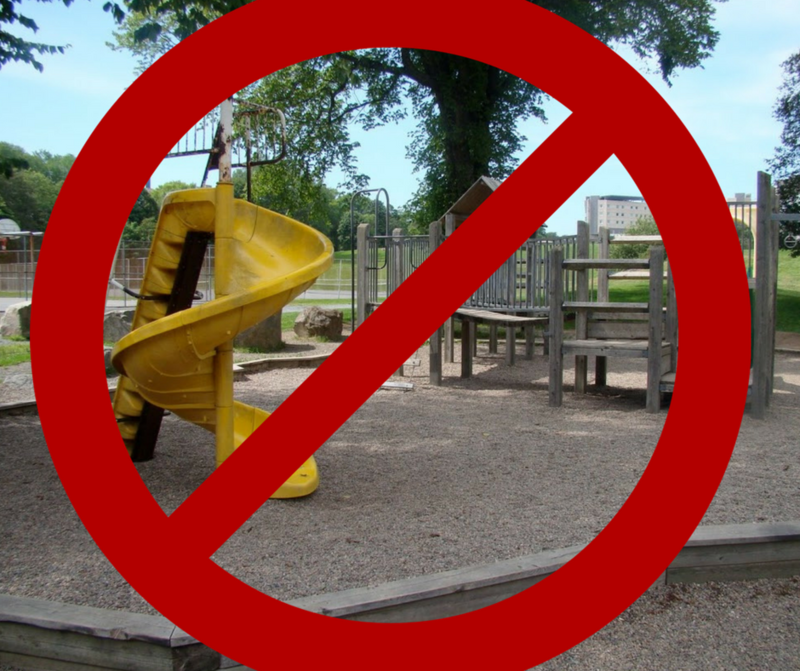 The special ed 3-5 yo are no longer allowed on the kindergarten playground…the kids who need the most exposure to opps to improve fine and gross motor…..
Let’s remember that these school playgrounds are open to the public after hours and kids can play on the equipment as they choose regardless of age. This post limits itself to commenting on the play structures. It does not touch on the debate linked to early school enrollment. There is a general recognition in all of this that playgrounds only represent one facet of engaging kids in play. Parents, educators as well as school and government officials all agree about the value and importance of play. In an ironic twist, the pre-primary program is heavily weighted to play-based learning. This presents a great opportunity to introduce other forms of play into the equation. A favourite of mine that continues to gain steam around the world is ‘loose parts play’. It’s a great fit for pre-primary. 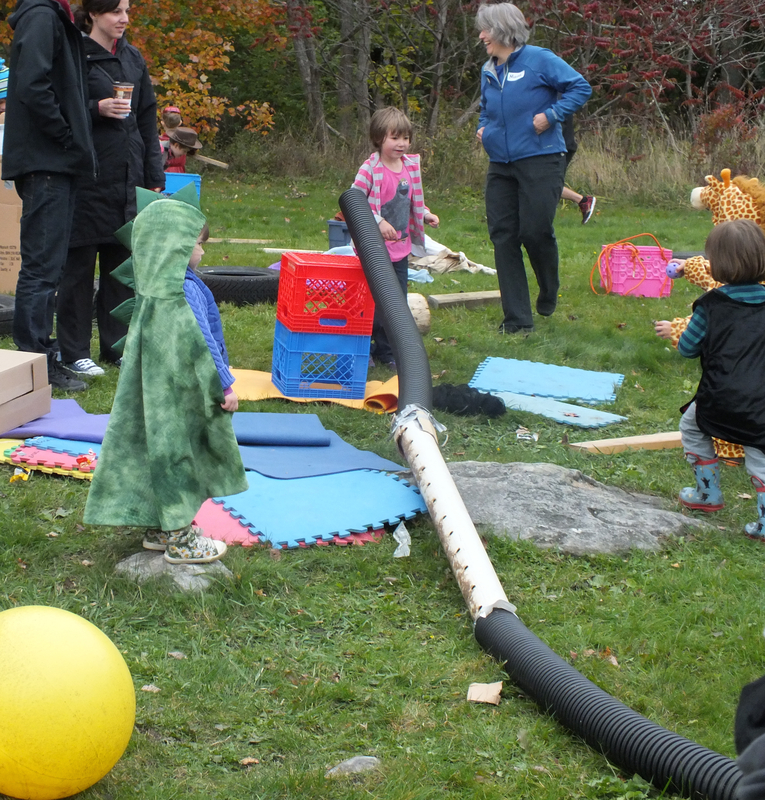 I have led loose parts play events with kids ranging in age from three to twelve-years-old. It’s always been a great success. 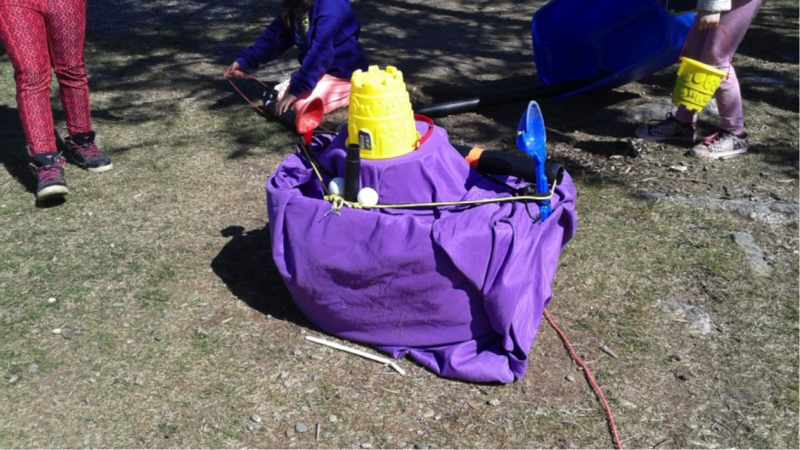 Many of the after school Excel programs throughout Halifax adopted loose parts play following a presentation on risk and play by the UK’s Tim Gill three years ago. Resources on loose parts here and its impacts in an Australian public school setting here. This ‘look – don’t play’ SNAFU has been covered by local media including CBC, Global, CTV, The Star – Halifax and Halifax Today. It’s great seeing resources allocated to these kind of stories. Across the country, developments led by designers, builders, parents, municipal governments, academics and recreation leaders are seeing a shift away from the old risk averse models of play to a context where risk and resilience are perceived as key elements in the renaissance of independent, outdoor play. 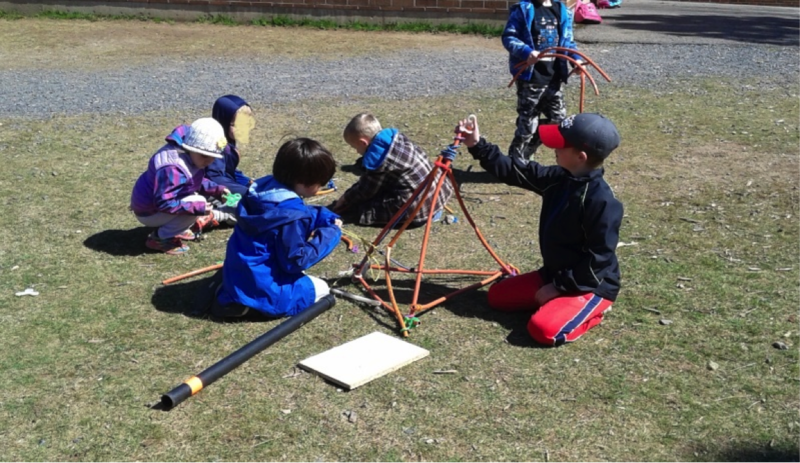 Ed’s note – It’s a pleasure to have a guest post on PlayGroundology from Tanya Moxley, a fellow co-founding member of Adventure Play YHZ, and as you will read below, a creative animator and leader for Halifax area pre and after school programs. With two young boys of her own, Tanya is a firm believer in the value of independent outdoor play. As she has shared with me on a number of occasions, their yard at home is a loose parts creativity and testing zone – a bit of a dream time for kids I would say. Tanya works as a volunteer at Halifax’s Wild Child Forest School where her interest is “working with parents to help them realize the importance of outdoor play for kids, families, and communities.” Tanya also spent three years working with a university professor researching links between outdoor play and child development. 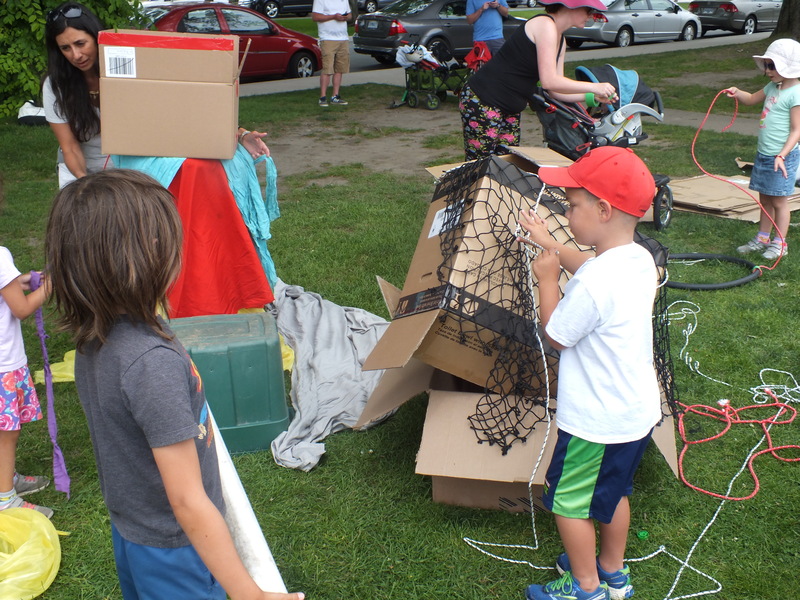 This loose parts – school board story is an indirect outcome of a public meeting and subsequent practitioner’s workshop held in May 2015 with Tim Gill. 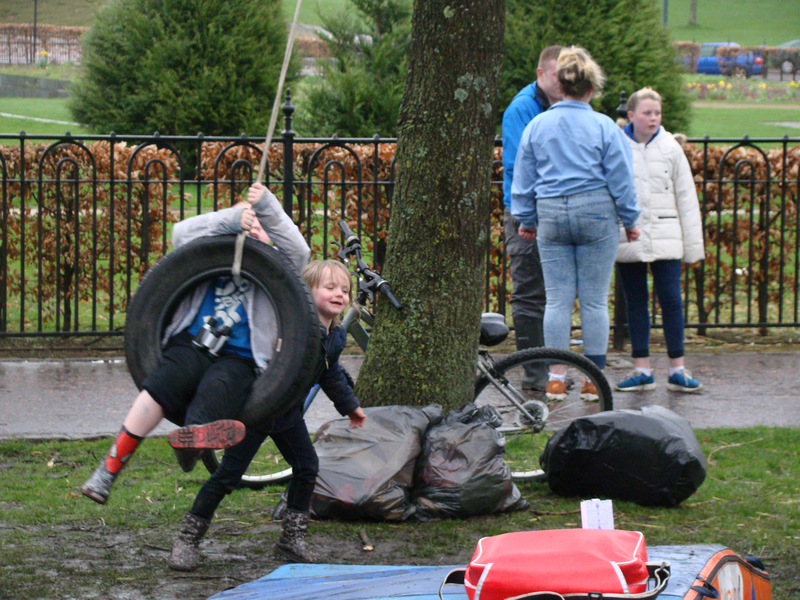 Many of the Excel leaders were present at one of the two events which examined risk and play and a greater variety of play opportunities in public spaces. 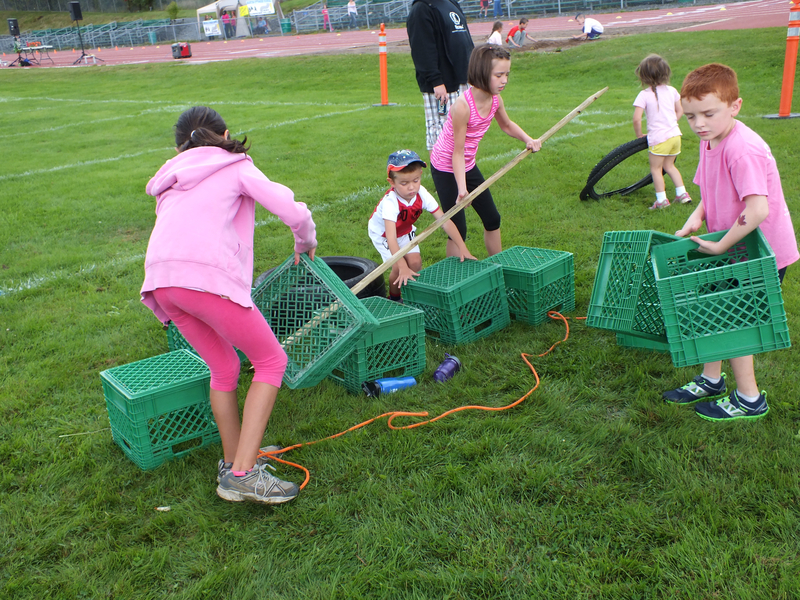 Hundreds of kids are saying thank you to the Halifax Regional School Board for stepping out and giving loose parts a try. Many thanks also to the Province of Nova Scotia’s Department of Health and Wellness whose Active Living Branch provided financial and logistical support that made Tim Gill’s visit possible. My name is Tanya Moxley and this past year I worked as a Group Leader with the Halifax Regional School Board’s before and after school program, called Excel. The regional recreation programmers were trying to find a way to include elements of ‘loose parts play’ into the Excel program. 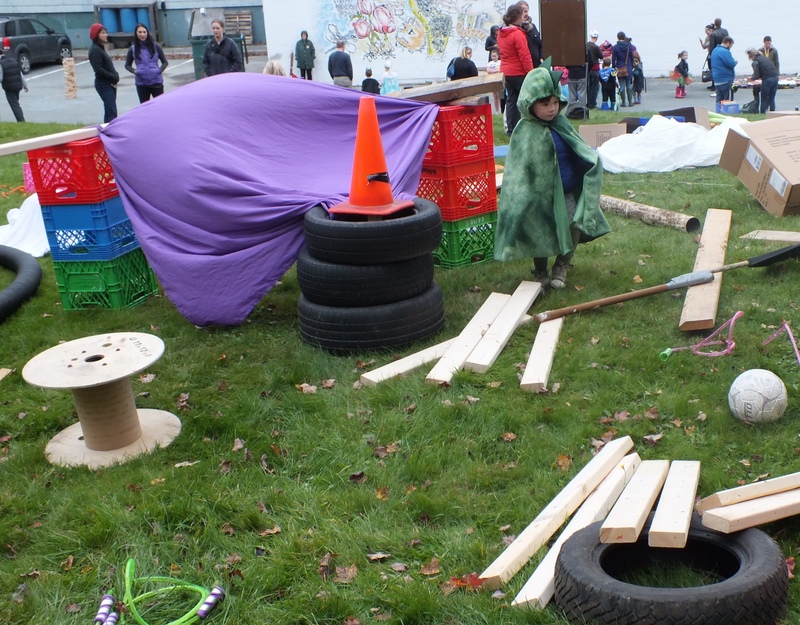 Some schools found it easy to integrate loose parts into their days or weeks, but others found it more difficult to get started. As I had joined Excel with some previous loose parts experience, we were able to introduce loose parts into the schedule at our school with considerable success in all the age groups from Primary through Grade 6. In a casual conversation with our regional programmer, I suggested in the late winter that I could visit some other schools to show them some of my own loose parts collection, and provide suggestions for both parts and storage. My suggestion was accepted, and I started my visits in late April. For seven weeks, I visited a different school each Monday, Wednesday and Friday for their afternoon program, for a total of 18 schools around the Halifax region. I traveled about 1,000 kilometres, and met about 900 students. Kids everywhere love loose parts play, because the materials are open-ended and easy to manipulate, with many possible uses. They didn’t have to be convinced about how much fun it can be! One primary concern among staff was storage. Upon seeing the materials and how they were being transported, almost all the program leads agreed that they had at least that much space to spare. All of my materials fit into four milk crates and two small ‘Rubbermaid’ tubs (18”x18”x24”) in the back of my car. Well, not including the ‘pipes’. The ‘pipes’ are a dozen or so PVC plumbing pipes, each about 3 feet long and 2.5 or 3 inches in diameter. Some fit together and some don’t, which leads to much experimenting and collaboration. Those have to go in the backseat of the car, wrapped up in a tarp for easy carrying. The ones we use at my regular school are stored in the kind of garbage can you get for your house garbage, with wheels on the bottom so kids can pull it around. Another key concern was safety, as many staff seemed to connect loose parts with danger. Once they saw the materials in use, everyone agreed there isn’t much risk, if any, involved. 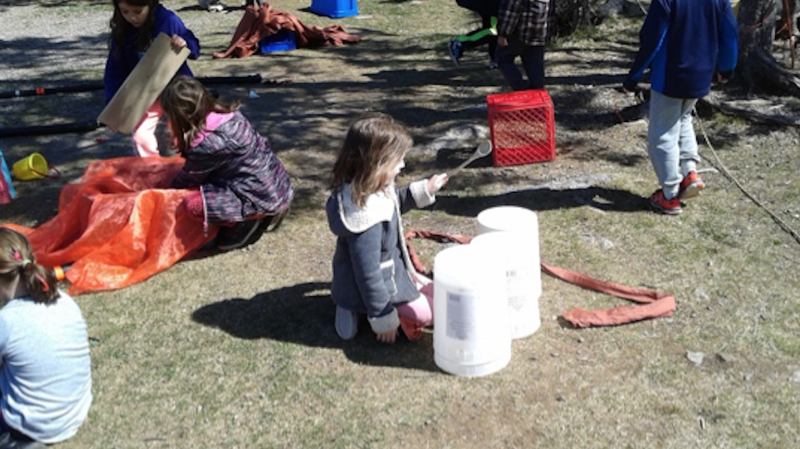 A nice thing about loose parts play is that it opens up conversations with the students about what risk could be involved, for example, in playing with long ropes. 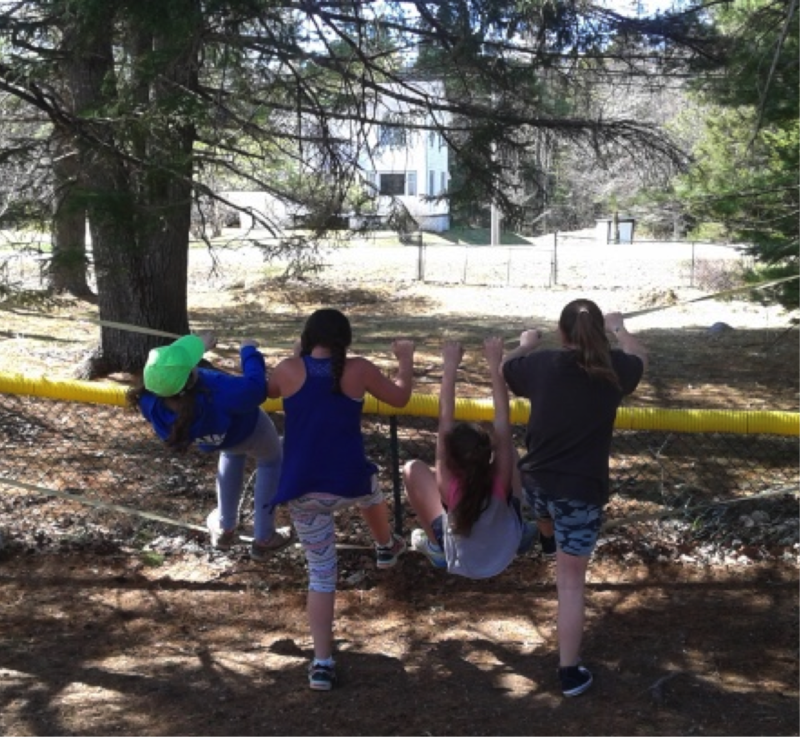 Having had a conversation as a group, the kids usually find ways to remove the danger, while still being able to use the item. This is a much better way to prepare kids for a world that we cannot and should not make try to make perfectly safe for them! The alternative, removing the item from use, teaches students nothing about assessing risk and developing the abilities to figure out how to mitigate risk through conversation and intentional experimentation – problem solving in a collaborative manner. The safety questions also tended to answer themselves over the course of the sessions. There were no accidents in any of the 18 schools during the 1,000 kilometre loose parts Excel marathon. Among the many interesting observations, was one made by two team leads who remarked as I was leaving that the day had been the quietest one they’d had all year in relation to behaviour issues and disruptions. In the larger programs (over 60 students), we held either one or two sessions of 30-40 minutes for younger students before the older students came out for their own session. In the smaller programs, the older students just joined right in with the younger ones. The largest group using the materials at one time was about 60, although this was only in one place where they had a particularly large, open outdoor space that accommodated the numbers. Usually the maximum was about 35. Setting up the space with similar items in groups, such as ropes, sheets, pipes, boards, digging tools, etc… allowed students to check everything out, get a group together, pick the items they wanted for a project, and then get to work. 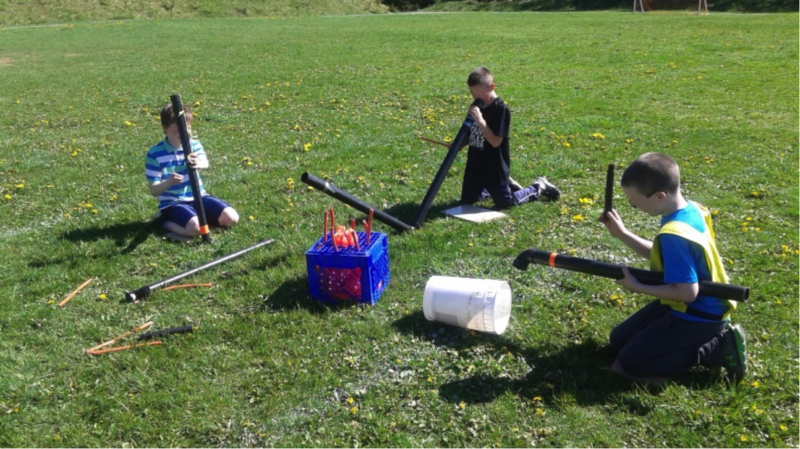 Staff members at multiple sites confirmed one of our key observations at my regular school, that loose parts is an activity in which gr 4-6 girls get particularly engaged; they do not spend the session moping around and not wanting to participate, as often happens with sports-related activities. This ‘sold’ many staff on getting loose parts started as soon as possible! It was interesting to watch how the uses of the materials varied across the programs. 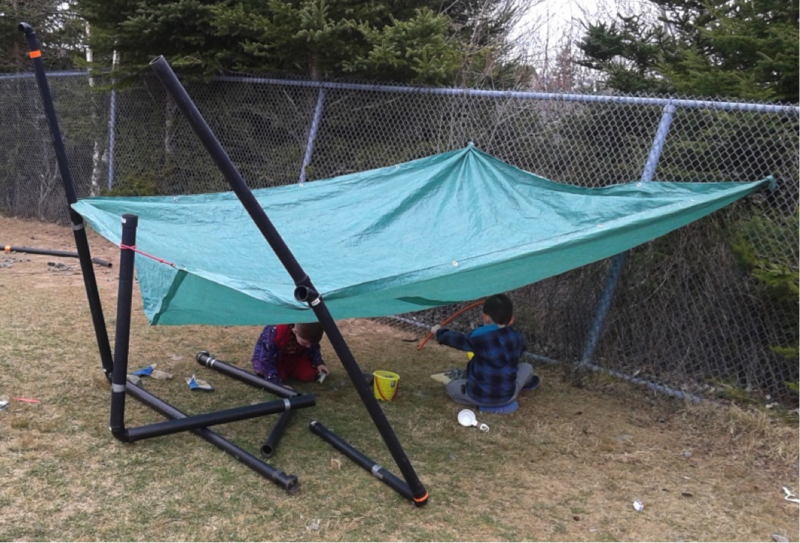 At some schools the fabric was entirely for building forts. At others, a group of students turned some of them into clothes for role-playing activities and protected them fiercely from the ‘building’ group. Similarly, the pipes were used at some places for building complex systems for transporting items from one place to another; at others, they became just another building material for the forts. For a third group they became musical instruments in combination with containers and spoons that at other programs were used for digging. Much to my astonishment, I only got a rainy day for one site! It was foggy and damp when I arrived at Oyster Pond, but I set up outside anyway, and the kids had a great time for about 30 minutes before suddenly it was pouring rain. We quickly moved everything inside to an empty classroom beside their regular Excel room, and the kids continued their fun with forts and pipes for the rest of the session. Their enthusiasm confirmed what I had been telling staff members at other sites – many of the materials work just as well inside as out. Tables on a side and some chairs work perfectly well for holding up forts! There were a few sites where I arrived the day or afternoon following a heavy rain, and the puddles in the play space provided an unexpected loose part that made for lots of extra fun. All in all this was a great adventure, and I hope that many of the places I visited will take the time to integrate loose parts play into their schedule this fall – the kids certainly had lots of requests for their group leaders about which things they liked best! 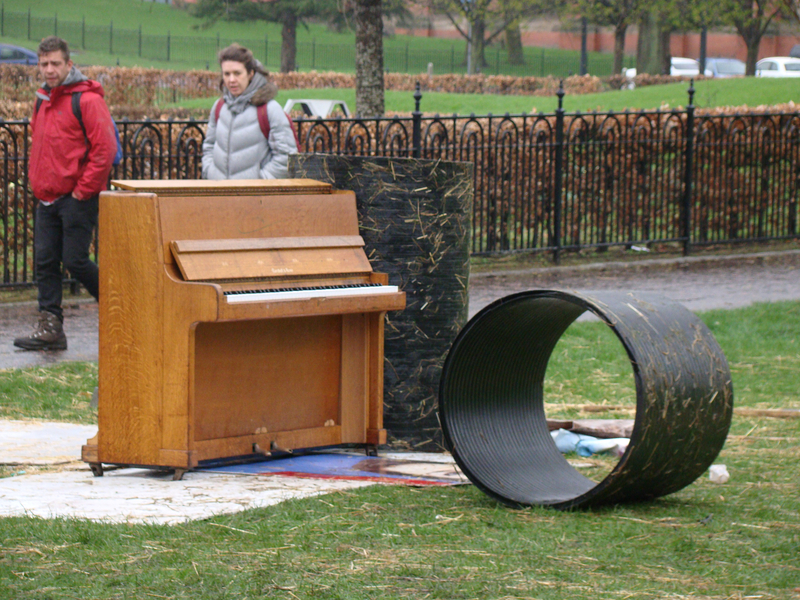 For more on loose parts read In Praise of Loose Parts and How Not to Cheat Children – The Theory of Loose Parts. 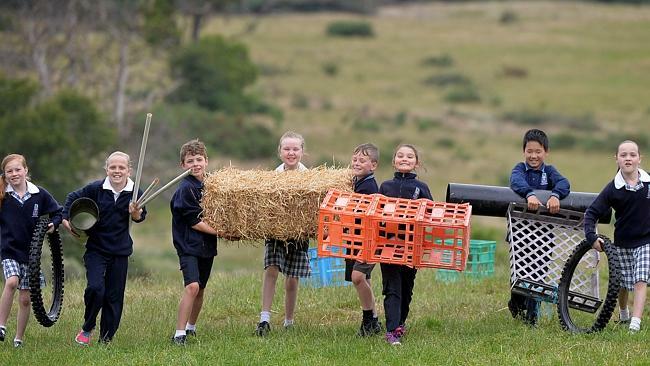 Kids at Emmaus Catholic Primary School in Mt.Clear playing on unconventional play items, hay bales, poles, tyres etc. Year 3/4 get ready for action. My first Storehouse sortie captures the story of the first public play event I helped organize. Click through to Storehouse story. In Canada’s Gulf of St. Lawerence, a maritme play aesthetic. This one is subtitled ‘Playgroundin’ in tropical Paris’ and tells the story of the search for a 1950s Székely designed playground in a Paris suburb. These are the pataugeoires – shallow, kiddy pools. One is deeper than the other and both are exquisitely detailed with carreaux cassés – broken tile mosaics now virtually a lost art. 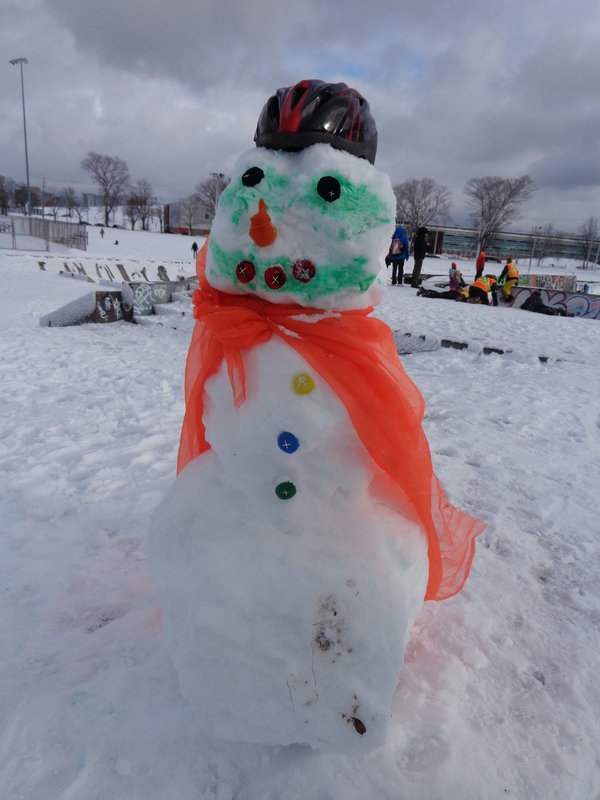 Our new playground pal Yves created carreaux cassés like this when he was a younger man. It’s no time to be still when a breath of wind drops the mercury to -39 C at Quebec City’s annual Carnaval…..
Thrills, spills – snowy saucers on sliding hills. I’m going to miss Storehouse. I had so many more stories left to share. 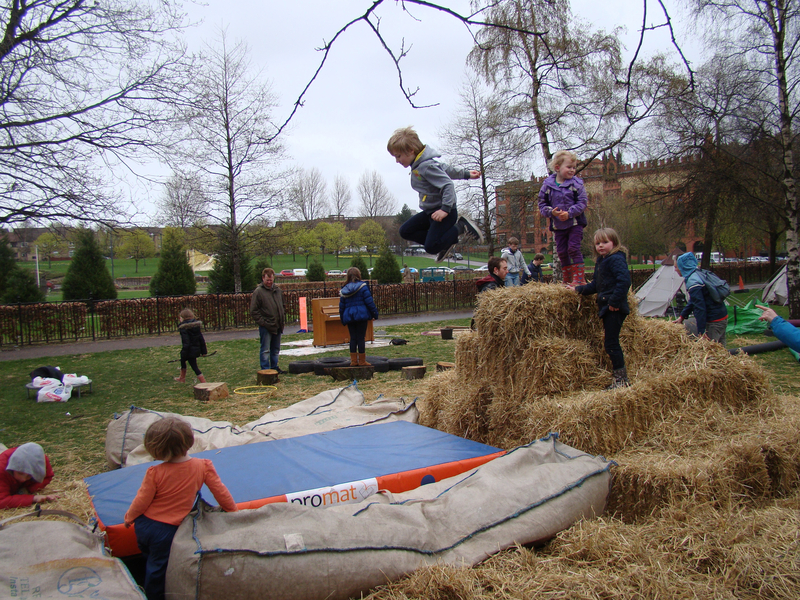 Thanks to the Storehouse crew for making a fun place to play…. 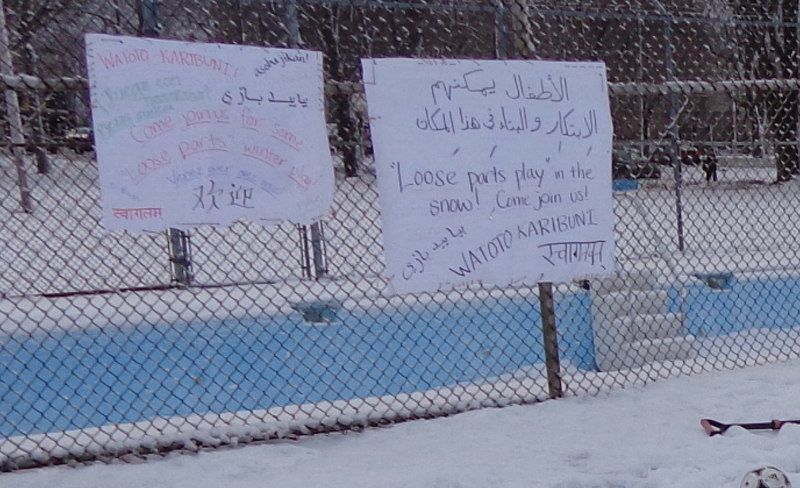 Every January there’s an outdoor event in Halifax, Nova Scotia to welcome new immigrants to the wondrous world of winter. For those who come from winter-free zones, it is tingly, heady stuff. This year our merry band of Adventure Play YHZers join the celebrations. It is our second public event. 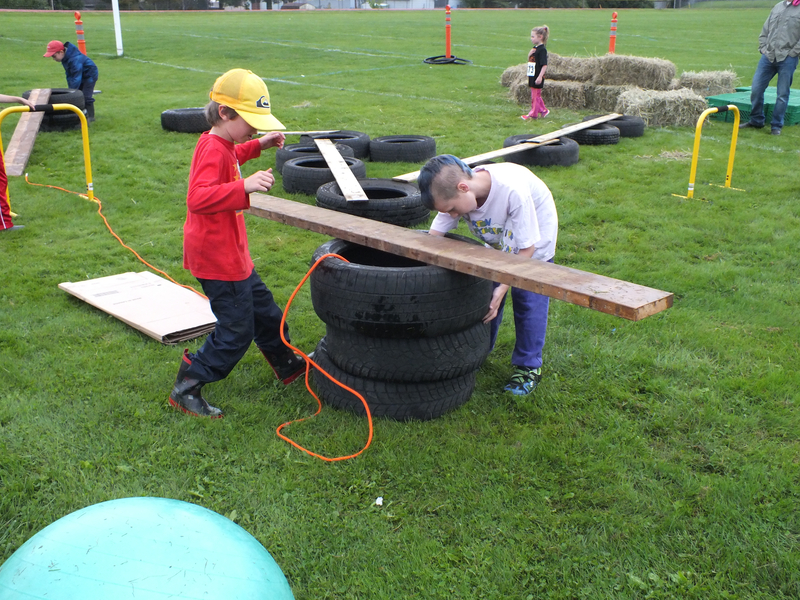 We have a sweet selection of loose parts on hand including PVC pipes, tires, milk crates, cardboard boxes and a multilingual sign welcoming people and inviting them to play. These quality play pieces were sure fire winners back in the fall with green grass underfoot. This time though, we are outflanked by chill temps and a fresh fall of snow. According to Reddit, there are about a billion snowflakes in a cubic foot and eight billion or more in a snowman. It’s hard to compete with these naturally occurring loose parts – each flake its own unique shape – unless it’s with something that transforms the snow such as shaping it into bricks. 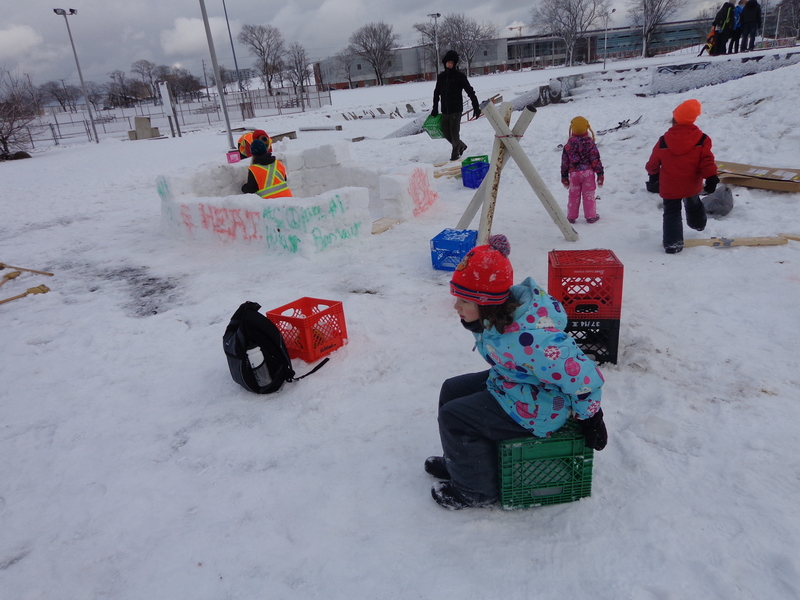 Close by our loose parts central, which isn’t suffering from overcrowding problems, there is one of the many off the shelf playgrounds that are found throughout the city. This is one of the larger ones close to the downtown core on the Halifax Common a large expanse of land that dates back to the city’s founding in the mid-18th century. Our kids grease the slide with snow to speed their descent into a cold embrace. 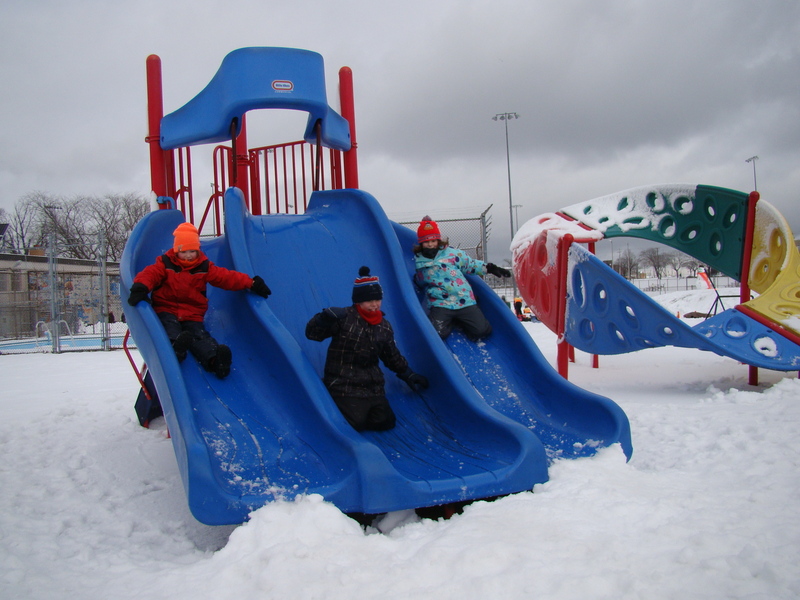 Snow makes all the equipment just a bit more slippery – stairs, ropes, rungs and slides. The kids practice being sure-footed and enjoy the thrill from a hint of risk. Also within a shout is the city’s biggest skatepark. 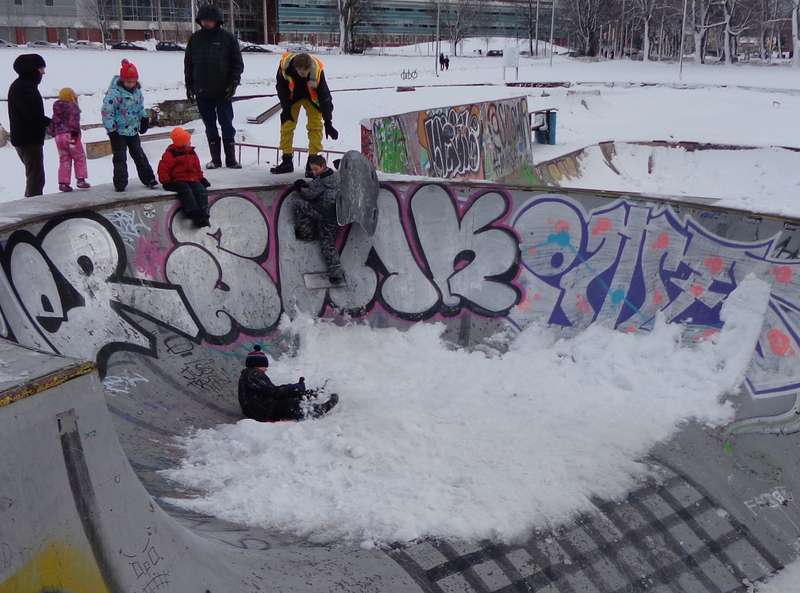 There are no skaters dropping off the edge of the bowl into the collecting snow but kids are finding other ways to make this an all weather venue..
It’s not everyday that you have a chance to get the adrenalin pumping in an unanticipated adventure. 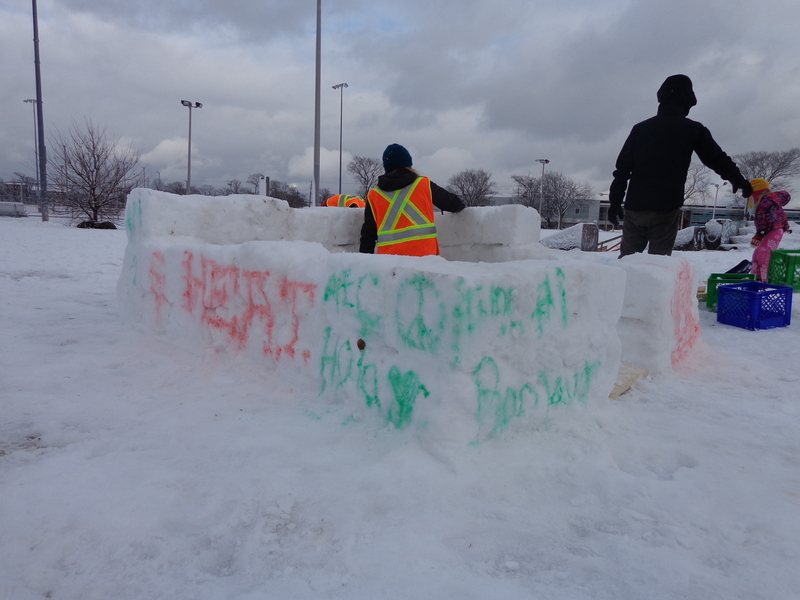 Future winter visits to the Halifax Common with our gang will now include a de rigueur pit stop at the skatepark. We have to leave early to get one of the girls to a birthday party. As we prepare to go, families of new Canadians are starting to cross the street as they leave the The Oval, the city’s outdoor skating venue of choice. On this particular afternoon, snow rules. One of nature’s loose parts par excellence takes the day. Welcome to winter….